Online admission for the Right to Education in Tamil Nadu has been started. Eligible students can apply for the same through online registration. The admission is going on for the year 2018-19 academic sessions. The announcement for the application invites in Tamil Nadu was made on 20 April 2018. The Directorate of Government Examination has stated that the application process has been started in the state of Tamil Nadu. Application forms are available on the official website http://www.dge.tn.gov.in/. Applicants can visit the website to fill up the form. All interested candidates will have to log online and complete the application process. For this, every applicant has to click on the link http://www.dge.tn.gov.in/. It will give the candidate assess to the authorized website. As soon as the page appears, the applicant has to scroll down the page to get to the specific link. The second last link is marked as “RTE Act, 2009 – 25% Reservation 2017-18 – ONLINE REGISTRATION.” One has to click on that link to get to the next step of application. This link will offer the candidate access to another page. Clicking on the online registration link will trigger the site to open that page. The address of the new page is http://tnmatricschools.com. The main application form will come up on the screen. The RTE application form is available in English and Tamil. The candidate can fill the form in the preferred language. There is a link that is marked as “Application.” All applicants need to click on that link to get the application form. Once all fields have been filled, in either English or Tamil, the applicant must revise the form to correct any errors. If everything is in order, then the applicant has to click on the button that is marked as “Submit.” It will save the application in the system. How to check RTE list? In case an applicant desires to check the updated RTE list, he/she has to do that online as well. For this, the applicant must click on the link dge.tn.gov.in. 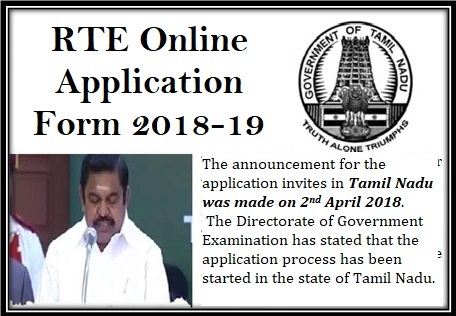 It is the official page of the Tamil Nadu RTE application process. After than every interested applicant has to click on the link http://tnmatricschools.com/rte/rteschoollist.aspx. Once the page opens, the applicant must type in details regarding the name of district, and the preferred type of educational institution. As soon as the applicant clicks on the button marked as “Show,” the site will process the available data and produce the list for that district. The list will be updated by the state RTE department from time to time. If the name of the candidates appears on the list, then he/she will get admission in the school. RTE or Right to Education is an Act established in the year 2009. According to this act, every child in India has the right to get education. Since 2009, under this act children who belong to weaker sections in the economy can enrol their names in schools. According to the rules of RTE Act 2009, 25% of the total seats in each school have to be reserved for the children under RTE Act. Nursery, Primary and Matriculation schools are available under the act. State-wise admission takes place under the act. Anyone who is willing to enrol their children’s names under the RTE Act in any of the available schools can visit official RTE website for more information or they can visit the school directly for any information. Before applying for the admission, guardians and applicants must read all the eligibility criteria and guidelines under the RTE Act. Also it has been stated that students who are living within 1 Km of the school area may get preferences under this Act. How can we know the status of RTE application 2018 – 2019 since the link“RTE Act, 2009 – 25% Reservation 2018-19″ have n’t open. Reply me Sir. How can we know the status of rteaplication 2018-2019 since the link ” Rte Act 2009 25%reservation 2018-2019″ have not open reply me sir.